Of course, visiting colleges may not be possible for everyone, but it’s a good idea to make the trips, if you can. 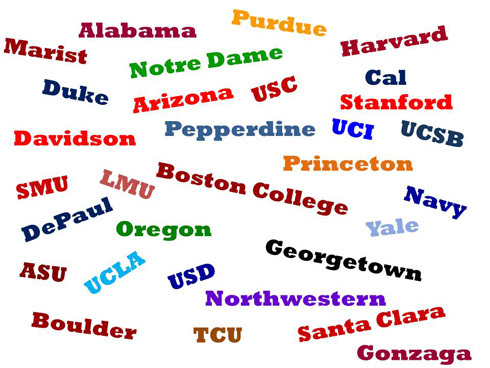 It can help you determine whether a college is the right place for you. To make these trips more cost effective, I always suggest to our students that they categorize their school choices by type and size and try to visit at least one from each category as close to home as possible. For example here in the Chicago area, Northwestern University can serve as an example of a small top level school, but also give a taste of large school athletic experiences; University of Chicago serves as a model for the Northeast Ivy League schools, with limited athletics but an elevated intellectual culture; Loyola University, DePaul University and University of Illinois at Chicago are good examples of parochial, private and public urban schools with small campuses and a large commuting population. Without even leaving town students can get a better sense of the type of college they want to apply to. This can also help narrow the choices for more expensive campus trips. Certain data speaks volumes about colleges. Find out the college’s retention rate — how many freshmen return for sophomore year. You should also research how many students who enroll actually graduate, and how long it usually takes them. This is information that tells you great deal about a college. These few pieces of information tell you how happy students are and how supportive the colleges are of their students.